Hope you are enjoying your summer. It's been so hot and humid here in the Pittsburgh area. So I thought I would cool things done a bit and bring you a Christmas card. My favorite TV shopping channel is having a big Christmas in July event. And, of course, I already started my Christmas shopping. Since, I am in the Christmas spirit I am featuring the Penguin With Presents and the Christmas Greetings dies. Let's get started with some details on how I created this card. 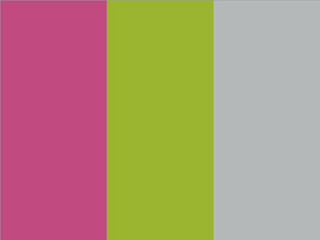 Step 1: This week I started with my card colors. I used the colors from the Splitcoaststampers color challenge #697 which are berry burst, granny apple green and smoky slate to create my card. The optional twist was to create a Christmas card. I love making Christmas cards in non-traditional colors. 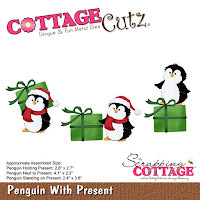 Step 2: I started my die cutting with the penguin and present. I used the berry burst for his hat, scarf and bow. The granny apple green makes a great color for a present. Don't you think? Next, I cut the pine tree for my wintry scene. Since the penguin is 2 1/4" high I needed a slightly larger pine tree so I selected the one that is in the Campsite collection. 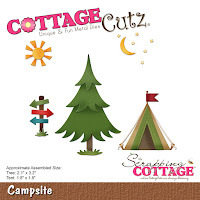 I cut from mossy meadow cardstock. My last die cut is the Christmas sentiment that I cut in the berry burst cardstock. I wanted a bold color on the snow bank. I cut it out 2x to give it more dimension on my card. Next I embossed the white image panel with a snowfall embossing folder. Step 3: All my card elements are ready so time to start card assembly. I secured the panels with double sided tape. I cut a snowbank and added some chunky glitter to the top. Used dimensional adhesive to attach to smoky slate layer. The Christmas Greeting sentiment was attached with Ranger Multi Matte Medium. Finished building my little scene by adding the penguin and the pine tree. I attached both with dimensional adhesive. I thought the top of the card looked a little bare so I cut 3 small snowflakes from the Snowglobe, Winter Accessories die in a white glitter paper to make them standout. Only 2 worked at the top so I used the 3rd to highlight the sentiment. Well that's it for me for this week. I hope I have given you some inspiration if you have these dies. If not, and you would like to purchase they available in the online store. See you next Saturday!!! Cute little scene, Mary -- and I like the colors. Super cute love the penguin and the sparkling snow!! Nice winter scene. I like it. Very cute card. I love the non-traditional colors for a Christmas card.